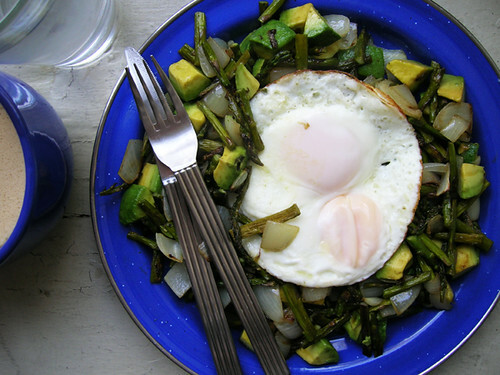 Still don't have peppers, so asparagus gets the onion treatment and it's very good. Really there are as many variations of this hash as vegetables that can be roasted, and I haven't even gone beyond salt and pepper yet. Also I just looked at my chart and hash is supposed to be my winter breakfast, it's supposed to be zoodles and squoodles for fall, oops. Trim and chop the asparagus, and dice the onion. Toss them in a baking pan with a little olive oil and salt, and put them in the oven for fifteen minutes. Stir and roast for another ten minutes or so. Fry some eggs in a bit of olive oil or butter in a skillet over medium high heat. Lately I've been pretty lush with my butter and olive oil, enough to swirl the eggs around in and cook the tops without adding water to steam them.